I was out with Wifey doing some birthday shopping for one of the grand bratz and we got this.. The DRIBBLE OS. I remember that one well! It has a very simple command set. All commands are prefaced by "BLAH" and followed by a bash on the keyboard. The more complex commands include "BLAH, BLAH, bash" and "BLAH, BLAH, BLAH, bash, BLAH". Wifey says your clearly well versed in Dribble. However you've forgotten the SPEW subroutine! Yes indeed! The output from that is always 'YEUK!" Edit: No, don't answer that! I dislike these kiddy laptops (and kiddy tablets) mainly for their lousy screens: in order to keep the price down many manufacturers have put small matrix LCD displays in the middle of the screen area, which isn't really going to capture a youngster's attention compared to mum & dad's colourful backlit screens. Others we've seen have a printed picture as a screen, with little LEDs lighting up next to each item in the picture when relevant. The laptop in the OP looks pretty good too, as it backlights static images on its screen instead of lighting a little LED nearby. It doesn't give the impression of being limited in functionality by its component costs. It's certainly better than most I've seen over the years. Of course, in the end nothing can compare with the real thing. My toddler, given the choice, will be far happier bashing away at my Archimedes keyboard in front of a copy of Edit running full-screen! To get even more serious, I would suggest, when they get a little bigger, not to buy a leapfrog tablet or other proprietary kids tablet? They are quite cheap but the software is terribly expensive for what it is, and they try and lock you in to their ecosystem. Far better to get a tablet (apple or android) then install appropriate apps from the store. The tablet may be slightly more expensive, but the apps are much cheaper, and they have things like video players, photo viewers and even cameras that can keep them entertained in a more versatile way. I speak from experience! Yes that is what we do. Give them the old tablet, setup family share on itunes. Only have to pay once across all devices and you have control on what is installed. Basically costs nothing. Last edited by Elminster on Thu May 03, 2018 12:28 pm, edited 1 time in total. pau1ie wrote: To get even more serious, I would suggest, when they get a little bigger, not to buy a leapfrog tablet or other proprietary kids tablet? They are quite cheap but the software is terribly expensive for what it is, and they try and lock you in to their ecosystem. Far better to get a tablet (apple or android) then install appropriate apps from the store. Couldn't agree more. My son who's autistic has had an iPad Mini since he was 2 and has learnt far more from it than anything else he has. His numbers, alphabet, colours, and much more. He's now 6 and even though he's mostly 'non-verbal' the iPad allows him to express himself. He even opens the browser and searches perfectly for 'youtube alphabet train', which is impressive considering his lack of communication. Can it run Elite ..? I got our 3 year old a cheap amazon tablet, I bought it when it was one sale and got some extra discount so it cost me 26 quid. Its great, he can do loads of stuff on it. Amazon have a special kids mode that once installed gives an easy to use front end and for a small subscription (I think its a couple of quid a month) provide access to loads of kids video, apps and books. The second hand shops are full of cheap computers. Maybe get some old desktop, load it with toddler software and hook up one of those childproof outsize keyboards to it, A-B-C rather than QWERTY. Though on the other hand, why give them real computers when they are still young enough to break everything? Also, kids are now trying to 'swipe' their books instead of turning the pages, say teachers. This whole computer thing may be coming in too early, similar to how it's best to teach kids to tell the time with digital watches only after they can do it from a clock face. Though on the other hand, why give them real computers when they are still young enough to break everything? We thought we had covered that one - we got ours some child oriented tablets, NABI IIRC. They came with a big rubber bumper. They had their own app store but they were, at core, Android tablets so you could side load other apps, including other app store apps which then extended your choice. They did, eventually, manage to break them though. Apart from the obvious hazard of breaking the screen many modern tablets/phones come with micro USB for the charging connection. I don't think I have ever known such a rotten connector - they tend to become loose and fall out even when carefully plugged and unplugged by an adult making sure to answers keep plug straight while doing so and are no match for kids being rough so you have to adopt and "adults only to put them on charge and remove them again". Also, kids are now trying to 'swipe' their books instead of turning the pages, say teachers. 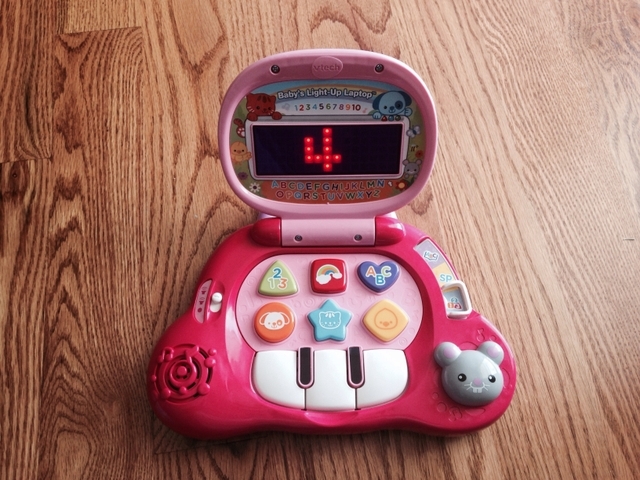 This whole computer thing may be coming in too early, similar to how it's best to teach kids to tell the time with digital watches only after they can do it from a clock face. I wonder how much we should worry about things like that. Reading is clearly important and it is easy to forget, sometimes, that Google does not search the content of your local library. But I can't remember the last time I ever did arithmetic "by the column method" which our daughters are now being taught at school. I mentioned this to my parents, suggesting it was an outdated skill, and they said "But what about the times you have no calculator with you but do have a pen and paper". For me, though, I always have my smartphone on me, and therefore always have a calculator, and write so little with a pen and paper it's always an effort to find these things on the rare occasion I need them. Are we a little slow to move with the times? On a similar theme I drew some money out of at ATM a week or so ago and was surprised to see new £10 notes coming out the machine. I had, of course, seen them before but I also spend to little money in cash that I don't handle many of them and it is the image of the previous incarnation of the £10 note that is lodged in my mind.